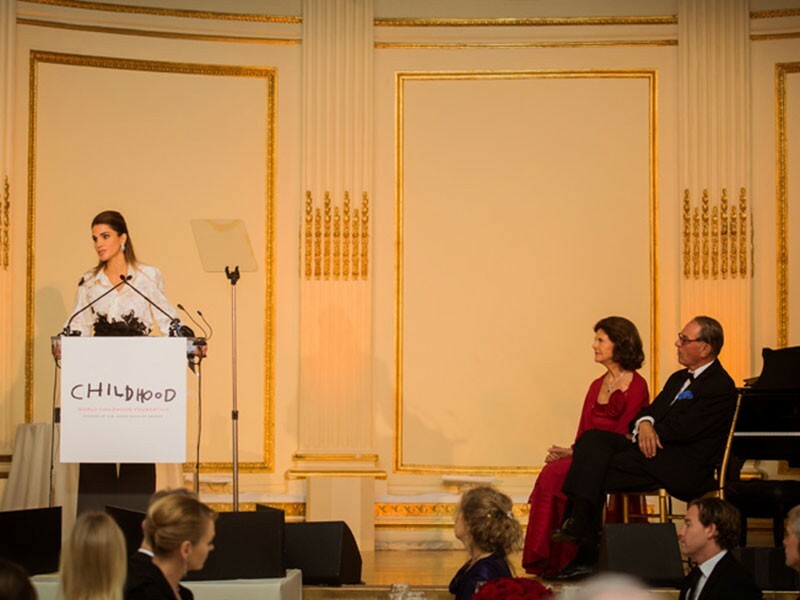 (Office of Her Majesty – Press Department – New York) Her Majesty Queen Rania, on Thursday, was recognized by Her Majesty Queen Silvia of Sweden, for her work in advocating for children’s rights in Jordan and the world at the World Childhood Foundation event in New York. Introducing Her Majesty at the awards dinner, the Deputy Secretary General of the UN Mr. Jan Eliasson spoke of Queen Rania’s longtime commitment to children’s rights, and her support for the work of the United Nations. The deputy SG also gave special tribute to Jordan, a country that has taken in hundreds of thousands of Syrian refugees despite limited resources. “There is no second chance at childhood,” said Her Majesty Queen Rania Al Abdullah during her acceptance speech. “With what we have…and who we know…we must all do what we can to keep the youngest members of our global family safe,” said Her Majesty. Queen Silvia of Sweden co-founded the World Childhood Foundation, a non-profit dedicated to ending the abuse and exploitation of children that has, since its inception in 1999, awarded over $100 million to projects globally.